“When we think of architectural photography we may at first associate it with a more academic style of impassive objectivity or the conceptual typologies of Bernd and Hilla Becher and their followers. 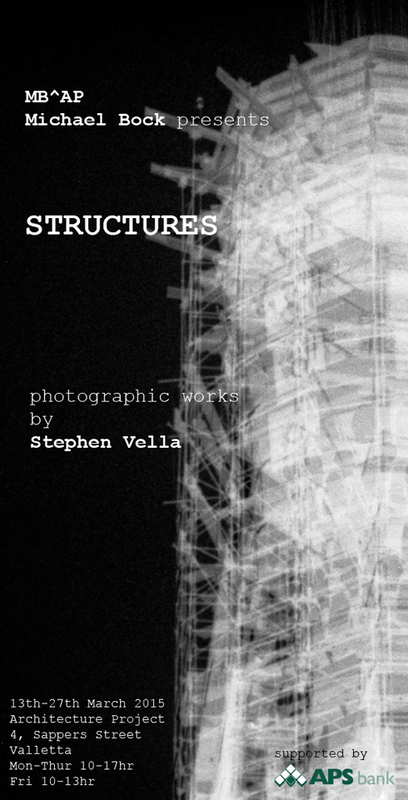 Stephen Vella’s black and white series of photographs is situated in a different field, distanced from a school of mere architecture photographic documentation, thereby breaking common rules of the field. The buildings depicted are isolated, taken out of context, their geometric shapes hidden behind and veiled by scaffolding which shrouds the facades. Through the simple technique of multi-exposure the hard-edged subjects are being presented as blurred, rather mysterious entities, their appearance heightened by sfumato ‘contours’. One is reminded of the oldest surviving camera photograph of 1826 by Nicéphore Niépce of his view onto neighbouring buildings. On the other hand one may interpret these edifices, obscured by scaffolding steel pipes and cocoon-like transparent membranes, as metaphors of protection and self-defence mechanisms against the penetrating view of the observer, while in reality shielding and protecting their vulnerable human inhabitants against the outside world. The exhibition is being complemented by a series of construction cranes, beings metaphorically connecting the sea with the sky. Their bodies translucent, their contours eaten by the grain of the photographic emulsion, light consuming and dissolving their epidermis. STRUCTURES causes in the viewer a tension both visual and emotional. The works oscillate between description and illusion, better sensed than seen." The exhibition is in part supported by APS bank.